This setup is an evolution of my previous three-way loudspeaker system with dipole tweeters. Instead of a dedicated DSP, the computer does all the filtering, equalization and phase linearization. I believe it's a better solution because the PC has all the power to compute the FIR filters for phase control. Replacing hardware DSP by computer software is just smarter and can be a lot more economical. This tutorial may help configuring the PC: Windows PC as a FIR Audio Processor. For the measures, I used John Mulcahy's REW analysis software. The dipole tweeters are ESS Great Heil AMT. They are 'great' in every respect: response, directivity, harmonic distortion. They have a high sensitivity and can be crossed-over remarkably low. The dipole peak is around 5.5 kHz. A piece of foam is disposed 40 cm behind each tweeter. It prevents effectively direct reflections against the near furniture. The graph (measure at 30 cm) doesn't show a first peak at 370 Hz that can be neglected in this context. The excellent Scanspeak Illuminator 18WU/4741T00 is used for bass/midrange. Six liter sealed enclosures are made of PVC pipes filled with a polyester fleece. The build is simple: just a PVC KGU-socket connecting sleeve (which has rubber rings) and two KGM plugs (no glue). Internal standing waves start at 800 Hz. Calculated Qtc=1.08 and F3=74 Hz. The bass extension is provided by two SB Acoustics 10” SW26DAC76-4 per channel. With dual rigid aluminum cone and moderate moving mass, this lightweight (neodymium magnet) driver can be used in a rather small sealed enclosure. Like the midwoofers, the 21 liter enclosures were very easy to build: PVC connecting sleeve, polyester fleece and two plugs. Internal standing waves start at 570 Hz. Calculated Qtc=0.86 and F3=35 Hz. Power is supplied by two Rotel RMB-1565 5-channel Class D amplifiers, one for each stereo channel. Digital to analog conversion is made by an 8-channel miniDSP U-DAC8 improved by a linear power supply. The computer is configured with Jonas Thedering's Equalizer APO. To generate the finite impulse response stereo WAV files I use Thomas Drugeon's rePhase loudspeaker phase linearization, EQ and filtering tool. 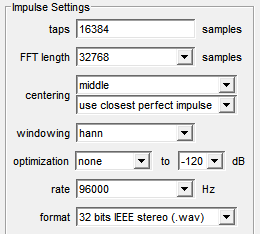 With the following impulse settings, precision is 2.9 Hz up to 48 kHz. Including 10 ms for APO processing, total latency is 95 ms. The crossovers are made of linear-phase low/high-pass filters. For the monopole speakers (mid and subwoofer), a regular second order low boost linearize the phase and magnitude responses. The tweeters dipole roll off is compensated by a regular monotonic first order low boost. This one is linear-phase reduced by 2 dB for a flatter in-room magnitude response. The following figures show the equalizations without and with low/high-pass filters. You may copy the settings to clipboard and load them in rePhase. monotonic first order low boost at 5 kHz, linear-phase reduced by 2 dB. second order Q=1.09 low boost at 94 Hz. second order Q=0.89 low boost at 39 Hz. The following figure shows the resulting close mic measures of each driver. This system has a broad sweet spot (or area) thanks to dipole tweeters. If not proposed by the recording, there is no illusion of depth. The sound seems obviously to come from the plan between the speakers. Localization of instruments or voices is evident, speech is articulated without excess. These features are likely related to time coherence. Big sound or large ensembles are depicted powerfully. Whatever the loudness, everything is played effortless (nothing's exhausting, no stridencies, compression nor blur). Overall balance being neutral, the wow factor is absent. Compared to traditional minimum-phase filtering this is an enhanced experience. With minimum-phase crossovers good results are obtained by finding settings that work well with the non-linearities of the drivers. By contrast, equalization and phase linearization let you cancel these out, and linear-phase filters let you build crossovers with arbitrary slopes. By means of this freedom, you can concentrate on other important aspects like driver's dispersion. Actually, you have a bunch of new opportunities to get the voicing you are looking for.